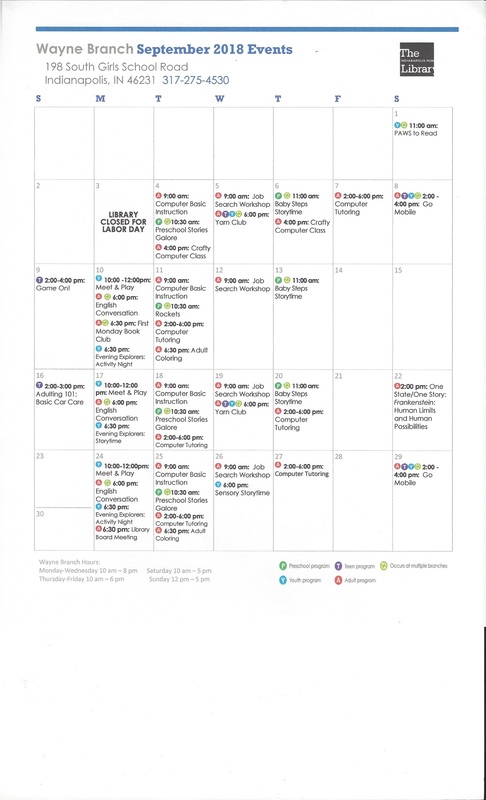 Attached are the September Calendars for the three Libraries that are closest to us – Pike, Eagle, and Wayne. 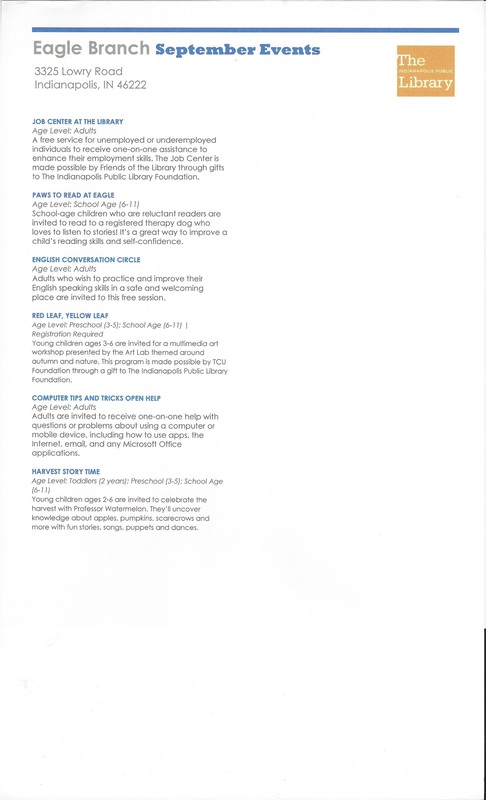 There are a lot of different programs at all three libraries for preschoolers through adults. 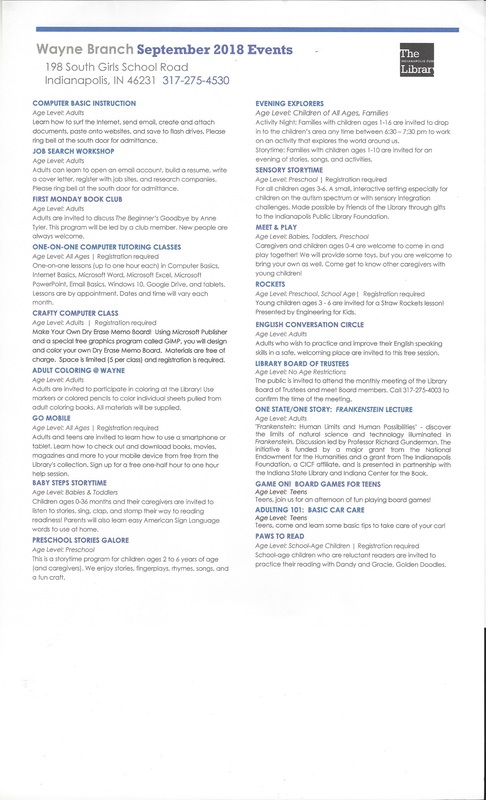 Check out the calendars and the descriptions of the programs and see if there is something that you and your family may enjoy. Just a reminder – all three of the libraries will be closed for Labor Day – Monday, September 3. 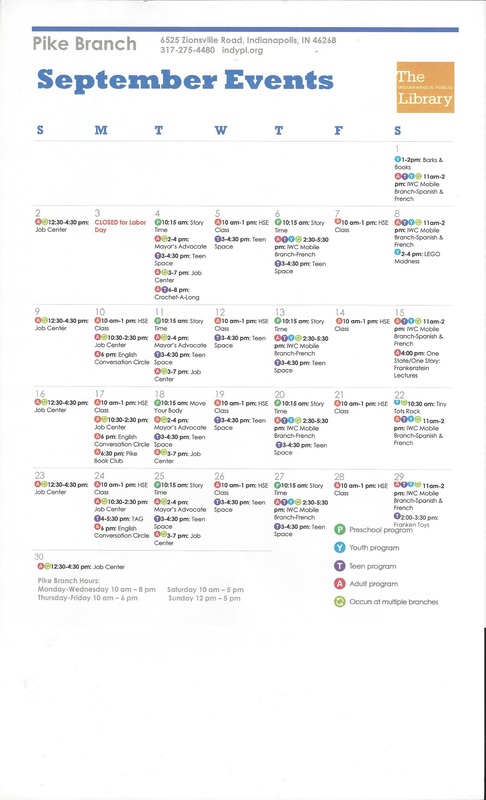 Regular branch hours are on the calendars. 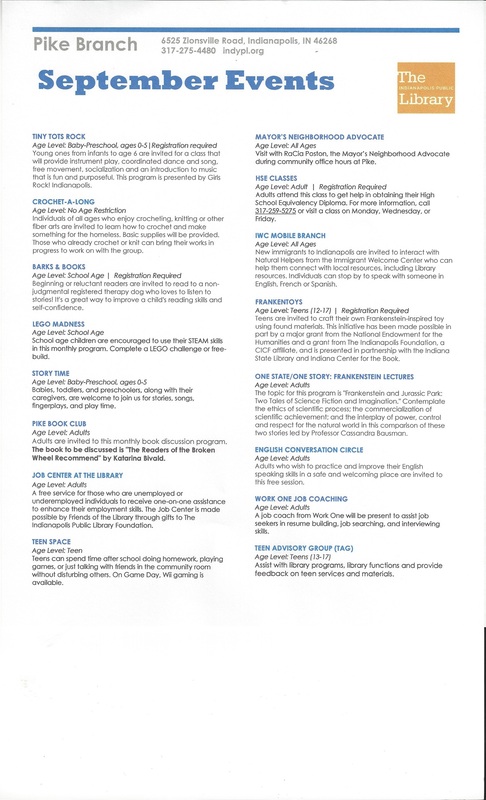 Also, I have included information about three special programs from our libraries. 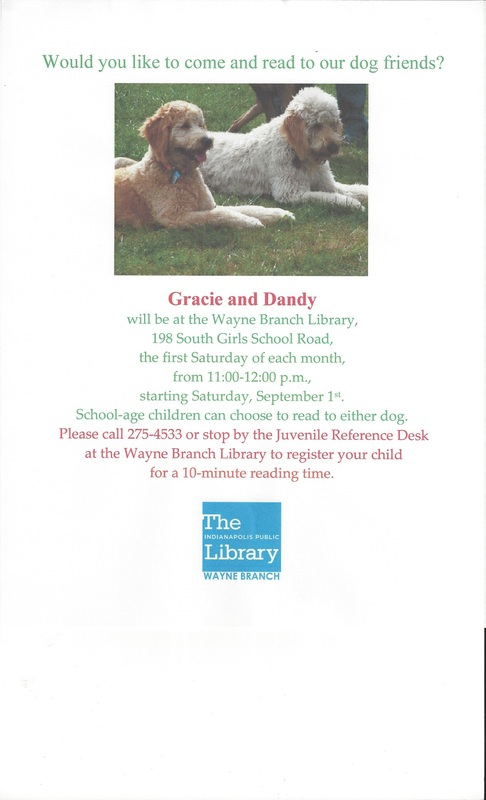 The first tells about a wonderful program for children who would like to read aloud to Gracie or Dandy. These are two dogs who love to listen to stories and will be at the Wayne Branch for that purpose. You do need to register for this program. This program is offered at the other libraries, too. See calendars for details. The second tells about a contest, The Slammin’ Rhymes Challenge XIII, for Marion County Students in grades 7 – 12. There is more information as well as the official entry form on the attachment. Could be a lot of fun for those creative teens! Take time to check it out. 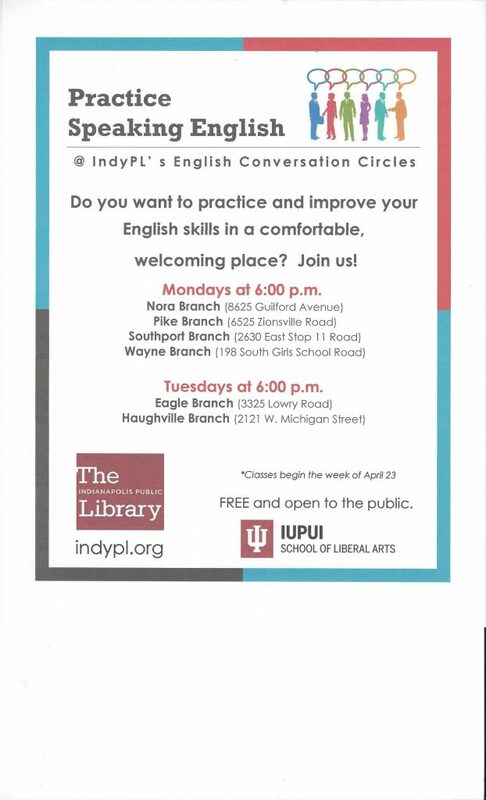 The third is the continuation of the English Conversation Circles. This is for those who want to practice and improve their English and is offered a various libraries. While I only attached the flyer in English, the libraries do have the flyer available in quite a few different languages. If you would like to post one in another language, contact one of the libraries and see what they have available. 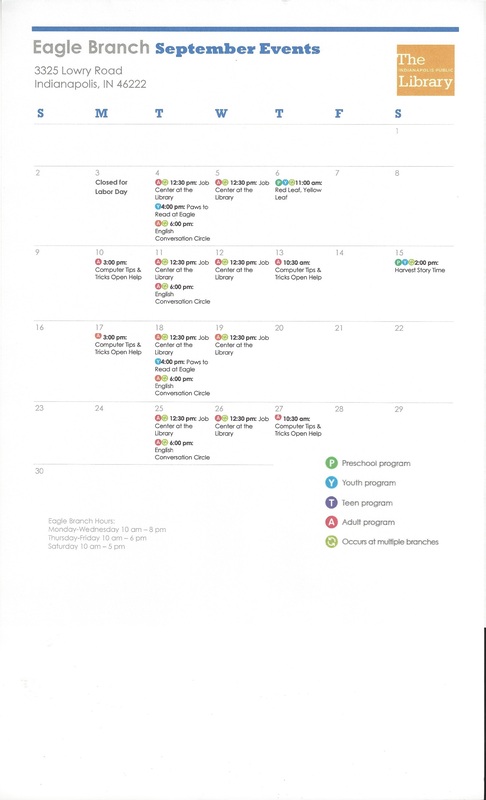 Hope the calendars and information on various programs is helpful. Please feel free to forward it to others who may be interested in knowing more about what is happening at our local libraries.